The modulation transfer function (MTF) of a photographic layer is customarily determined by means of photographic photometry. It is difficult to obtain the true function because of the interference of adjacency effects. De Belder, et al. have recently presented a method of obtaining the MTF from physical measurements of the layer. This method, which utilizes the random-walk technique, simulates the physical processes involved and requires data concerning several physically measurable parameters, including the absorption and scattering coefficients. 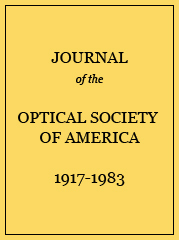 Data for these coefficients, which De Belder lacked, have been obtained from measurement of the volume reflectance and volume transmittance of the layers by the technique developed by Wolfe, DePalma, and Saunders. The coefficients were calculated by using the Schuster, Kubelka–Munk two-flux, radiative-transfer theory. After the necessary parameters had been measured for several fine-grain silver bromide photographic layers varying in thickness from 3 to 33 μ, the MTF of each of these layers was calculated. These values were compared with the MTF of the layers measured by photographic photometry, when they were developed under conditions giving minimal adjacency effects. Good agreement was obtained between the results of these two methods; the calculated physical values, however, were consistently somewhat higher than the photographic values. At least part of this lack of agreement is caused by halation in the photographic layers from the base-air interfaces. Statistics for 1000 incident photons. Backing—Acheson Dag dispersion colloidal graphite in alcohol.